Ecoable Bamboo AIO (All in One) Diapers with an absorbent Sewn-in Soaker and a Pocket Option. Features: 100% Bamboo Inner lining -Great for babies who are sensitive to synthetic materials. Sewn-in absorbent insert. 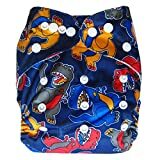 3″ x 3″ adjustable snaps plus hip snaps Pocket for additional inserts (Great diaper for a heavy wetter) Breathable waterproof lining of PUL. One Size fits baby from birth until potty training: 8-35 pound. 16mm White Classic Croco Grain Leather Watch Band Strap (Quick Release Pins!) with Stainless Steel Buckle – Fit’s All Watches!!! 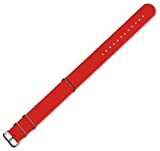 Grey Croco 18mm Watch Band Fits Philip Stein Small Size 1 (With Built in Quick Release Pins) !!! !